I led the discussion in our group Bridges yesterday, on the topic of managing triggers. I thought I’d share it here for the benefit of a wider audience. 🙂 Just brushing the surface of what can be a very big topic – What are triggers? Anything in our environment that ‘triggers’ a reaction so quick or so strong it bypasses our conscious control is a trigger. On a simple level, touching something hot and recoiling without thinking about it is an example of a trigger. When we use the term in mental health, we’re usually talking about things that trigger strong emotions, strong memories or flashbacks, dissociation, or for those with DID/DDNOS (Dissociative Identity Disorder or Dissociative Disorder not otherwise specified), perhaps alters. Really, anything can be a trigger. Some of my triggers are certain smells, such as a particular brand of cologne associated with bad memories for me, sounds such as certain songs or music, places – such as my old school ground, and situations such as encountering someone aggressive or violent. Everyone has some things that trigger a reaction in them, and triggers are not necessarily a bad thing. It isn’t just strong bad memories or strong negative emotions that can be triggered. Positive memories and emotions can also be triggered by things in our environment. Hearing ‘our song’ on the radio, being present at a birth, smelling something that we associate with a loved one – great grandma’s perfume. All these things can trigger a strong, even overwhelming reaction in us, and this is a good thing. To be moved by things is part of what it means to be human. So for those of us who find triggers difficult to cope with, it can help to remember that the goal is bringing them back to something manageable, not getting rid of them altogether. I’ve pulled out of my journals this poem I wrote about being triggered in a positive way. At this time in my life I was suffering from severe dissociation. Most of my senses were dulled severely, I could not taste, my sight was limited and colours were dull. My sense of touch was reduced, a hand on my arm felt faint and far away, I couldn’t feel my feet touching the ground. It was a very bad time and very distressing. On that evening I was coming back from an event, being driven through the city. As I came along King William Street, the bells of St Peter’s Cathedral rang out. And the sound triggered me, I surfaced through the dissociation and suddenly felt alive again, for a brief moment. Yesterday I woke with a fire in my chest. All the leaves of autumn burned. In dream-haze, in exhausted slumber. I turned and looked with eyes that turned and looked with me. Would return when the flame was ash. Was brief. For a glorious moment I touched the night. And I know you will not stay. For more about sensory dissociation, please see Surfacing from dissociation. For more about managing dissociation with help from your senses, see Using Sensory Supports. For more about reducing dissociation or anxiety, see Grounding Techniques. However, triggers can make life very difficult! If, like me, you find that you are very reactive and struggling to manage many triggers, here are some starting points on ways to try and calm things down. One of the first options most of us try is to avoid. It’s worth mentioning because it is a legitimate option! If the trigger is something easy to avoid, like a particular location you don’t need to go near – for me, my old school, then avoid it! Easy. This option falls apart a bit if you have lots of triggers or triggers that are really common in your everyday life. Then you end up not being able to get out of bed. But there’s no prizes for stressing yourself out trying to make yourself cope with a bad trigger you don’t need to confront. Desensitisation is another approach. This comes from treatments for anxiety and phobias. The idea is that you gradually build up your ability to cope with a trigger, until it gets to the point where it no longer affects you. For example, for awhile there the smell of rosemary was a trigger for me. It would immediately make me feel extremely nauseous. So, I used to occasionally put an oil blend containing a tiny amount of rosemary in an oil burner on days I was having a good time, friends over, feeling good. It would bother me a little bit but not much. Over time I increased the amount slowly, and kept linking the smell to good, fun experiences. Now, it doesn’t bother me at all and own a rosemary plant I cook with all the time. This concept of association is what gives triggers their power to affect us – they have been associated with a strong feeling or memory. Sometimes you can in time break down that association and create a new one. Using Anchors to Manage Triggers. If you find yourself jumping at shadows and reacting to everything, then going through each trigger one at a time is probably going to be time consuming and frustrating. In that case it may be a better idea to work on lowering your reactivity. 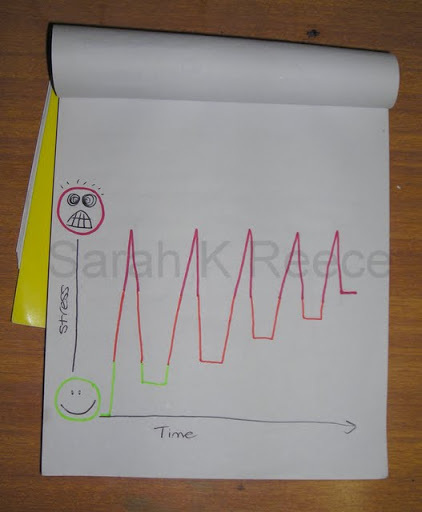 If your baseline stress levels are really high, you are much more sensitive to triggers. What do I mean by that? Your baseline is what you return to after stress. 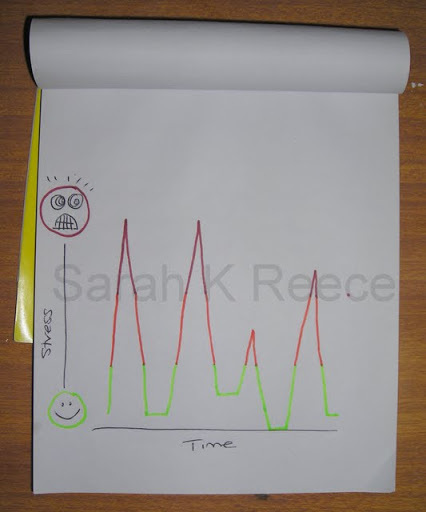 So, in this picture, those red spikes are periods of massive stress, while the green zone done the bottom is you feeling all chilled out and okay with the world. I continue talking about the management of triggers and the risks and benefits of the way we think about them in Mental Health needs better PR. I would be interested in reading your thoughts on how to “identify” triggers. For me, I’m struggling to recognize what actually triggers a lot of my reactions, behaviors, and moments of dissociation. I know this is part of being mindful of thoughts and environment, but it can be very hard for me to pin-point exactly what just happened in moments when I’m sensing myself shutting down. I’m loving your blog, by the way. 🙂 I look forward to reading more from you. Reblogged this on Sarah K Reece Consulting. That was so helpful, Sarah. Triggers are one of my biggest problems.